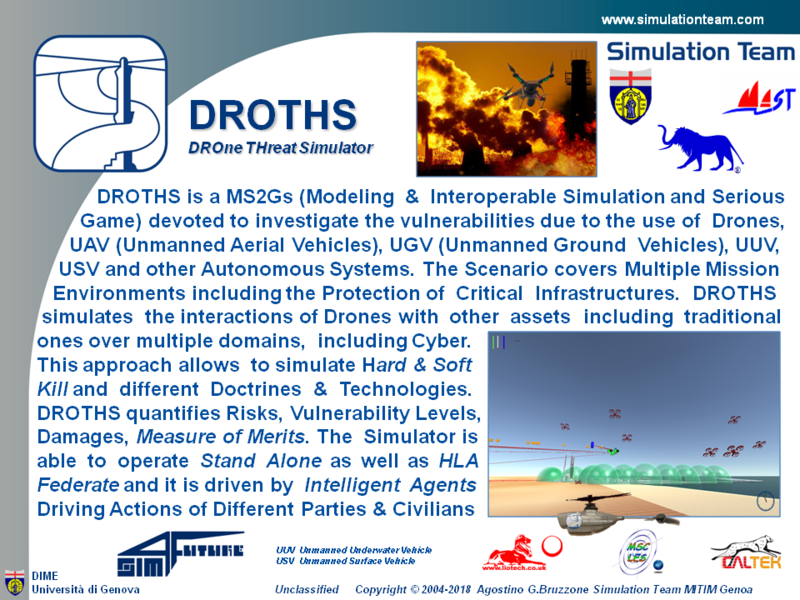 DROTHS is a MS2Gs (Modeling & Interoperable Simulation and Serious Game) devoted to investigate the vulnerabilities due to the use of Drones, UAV (Unmanned Aerial Vehicles), UGV (Unmanned Ground Vehicles), UUV (Unmanned Underwater Vehicle), USV (Unmanned Surface Vehicle) and other Autonomous Systems. The Scenario covers Multiple Mission Environments including the Protection of Critical Infrastructures. DROTHS simulates the interactions of Drones with other assets including traditional ones over multiple domains, including Cyber. This approach allows to simulate Hard & Soft Kill and different Doctrines & Technologies. DROTHS quantifies Risks, Vulnerability Levels, Damages, Measure of Merits. The Simulator is able to operate Stand Alone as well as HLA Federate and it is driven by Intelligent Agents Driving Actions of Different Parties & Civilians.